Oregon is rated as one of the best producers of saw chains, guide bars, forest accessories, outdoor equipment parts and sprockets in the world. Their products are not only top rated and affordable, but they are also the sign of leading technology, and being ahead of the competition. Oregon Saw Chain Manufacturing Corporation was born in 1947, and started with just four employees. Now part of Blount Inc, it operates with over 3,000 employees and thousands of products. Its innovative team were responsible for producing ‘world firsts’ in many areas, including the commercial grade chain which was based on the teeth of a larvae insect. Oregon consistently produce some of the best and top rated accessories and chains on the market today. Because Oregon is so focused on producing quality chains and accessories for other leading brands, they don’t produce many of their own saws. Currently on the market they have two cost-effective options. Both have bode well in online reviews and this buying guide. These two models include the Oregon CS1500 18 inch electric powered chainsaw, and the Oregon CS300-A6 16 inch electric powered chainsaw. When you purchase a chainsaw built by Oregon, you know you are buying one of the best on the market today. You are also guaranteed the best deal, as Oregon price their saws well in the market to be competitive alongside other makes, models and manufacturers. The only maintenance required is refilling the bar and chain oil. It has a powerful 15 amp motor. Its 18 inch chain cuts through a wide variety of logs and branches. It requires a power source. It’s not designed for professionals or commercial grade use, therefore the market is limited. You will need a heavy duty extension cord. Oregon CS1500 electric powered chainsaw. Dimensions: 10.5 x 37.5 x 18 inches. QWhere can PowerSharp replacement chains be purchased? APowerSharp chains and sharpening stones as a kit are purchased through any Oregon dealer, or online at Amazon. QDoes it start well from cold? AIt is an electric, instant push button start. ANo, it produces very little noise. It’s hard to believe the Oregon CS1500 is not a gas saw. If it weren’t for the low maintenance attributes and reduced noise levels, you would think it was! The sheer power on offer with the 15 amp motor ensures this chainsaw will get any domestic cutting job done with ease – even those big winter wood piles. This chainsaw is packed full of features and is very affordable to buy. It’s clear to see this electric powered saw is the best Oregon chainsaw for the money. Check out what other people who purchased this product think about it. 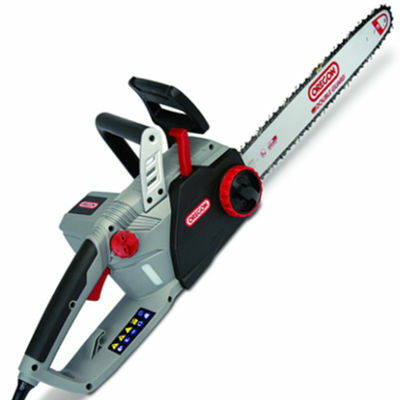 Read Oregon CS1500 corded electric chainsaw reviews. You have to buy a more expensive chain to make it self-sharpening. You can’t take it far from a power source unless you have spare batteries. It can be difficult to replace the chain. 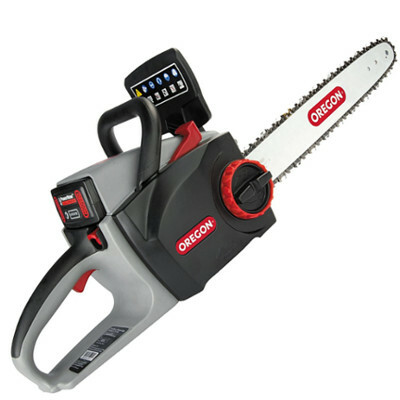 Oregon CS300-A6 electric powered chainsaw. Optional battery and charger (pay extra). Dimensions: 12.13 x 11.13 x 16 inches. AIt can cut up to 400 branches at around 2-3 Inch in diameter. QWhat kind of battery does it take? A40V Max Lithium Ion. Users can opt for 2.4Ah, 4Ah or 6Ah. If you don’t have time for maintenance and domestic cutting is all you require, this CS 300-A6 ticks all the boxes. It’s durable, quiet, affordable, has top rated features and in comparison to other brands of similar specs, is great value for money. Reviews online for this chainsaw have been outstanding, and you are sure to get the best deal when purchased from Oregon dealers and online at Amazon. Check out what other people who purchased this product think about it. Read Oregon CS300-A6 cordless electric chainsaw reviews. Alongside their extensive range of chains, sprockets and accessories, Oregon also produce chainsaw safety gear and chaps. Their chaps are constructed of the highest quality materials to keep you safe in the field. They have a 600 denier Oxford shell, an adjustable waist, eight layers of breathable knit and are adjustable in length as well. Not only are they incredibly protective, but they are affordable and come in a few different color options as well. If you are looking specifically for Oregon chaps, check out this comprehensive guide about available Oregon chainsaw chaps. However, if you’re looking for chaps in general regardless of the brand, you would love to read this full buying guide on how to select the best chainsaw chaps for the money including reviews & comparison. Your hands can be exposed to some pretty nasty stuff when out working with nature, such as bark, sap, oil, grease and grime. Oregon chainsaw gloves are top rated on the market, and have plenty of protection to see you through the job with full hand protection.. They have smooth leather material, are reinforced with leather in the palms to reduce vibration, and are bright orange for optimum visibility. They are also snug fitting to ensure they stay on tight. Oregon chainsaw gloves are also for sale for a reasonable price on websites such as Amazon and in stores. If you are looking specifically for Oregon gloves, check out this comprehensive guide about available Oregon chainsaw gloves. However, if you’re looking for gloves in general regardless of the brand, you would love to read this full buying guide on how to select the best chainsaw gloves for the money including reviews & comparison. Oregon offer two helmet types for those in the forestry, or those who operate a commercial grade saw. They take high impact, are scratch resistant and even have a UV stabilised helmet shell. You also get plenty of ventilation with 20 holes, and there’s a stainless steel mesh visor to prevent bark flicking in your face. The second option is perfect for a homeowner. It has six ventilation holes, has a stainless steel visor, ear muffs and meets several helmet standards. Never undertake tree cutting or forestry work without a helmet. Choose a top rated and affordable Oregon helmet. If you are looking specifically for Oregon helmet, check out this comprehensive guide about available Oregon chainsaw helmets. However, if you’re looking for a helmet in general regardless of the brand, you would love to read this full buying guide on how to select the best chainsaw helmet for the money including reviews & comparison. If you are looking specifically for Oregon boots, check out this comprehensive guide about available Oregon chainsaw boots. However, if you’re looking for boots in general regardless of the brand, you would love to read this full buying guide on how to select the best chainsaw boots for the money including reviews & comparison. Oregon chainsaw sharpeners are by far some of the best on the market. They allow chains to stay sharper for longer, are made of quality steel and are constructed using state of the art equipment. There’s no skimping on quality when it comes to Oregon. Their files are Swiss-made and double-cut, and are available in several different sizes and quantities. Each package of files are labeled with the diameter as well which gives users the convenience of knowing whether it will fit their saw or not. If you are looking specifically for Oregon sharpener, check out this comprehensive guide about available Oregon chainsaw sharpeners. However, if you’re looking for a sharpener in general regardless of the brand, you would love to read this full buying guide on how to select the best chainsaw sharpener for the money including reviews & comparison. Nearly every brand, make and model of chainsaw on the market today is fitted with an Oregon bar. Preferred manufacturers by many, Oregon is leading in the way in bar design. Oregon bars are designed and manufactured to last longer than average, and to cut faster and easier with more precision. They are recommended as replacement bar and chain manufacturers of choice by many consumers and leading chainsaw manufacturers around the world. If you are looking specifically for Oregon bar, check out this comprehensive guide about available Oregon chainsaw bars. However, if you’re looking for a bar in general regardless of the brand, you would love to read this full buying guide on how to select the best chainsaw bar for the money including reviews & comparison. There are so many different chains required for chainsaws of varying makes and models. Leading chainsaw manufacturers are constantly calling upon the services of Oregon to make these chains and it’s clear to see why. Whether you’re felling, topping or trimming, you are sure to find an Oregon chain to suit your needs. These include low kickback chains, professional chains, narrow kerf chains, specialty chains and more. All Oregon chains are sharp and durable – exactly what you need to get your cutting job done with ease. If you are looking specifically for Oregon chain, check out this comprehensive guide about available Oregon chainsaw chains. However, if you’re looking for a chain in general regardless of the brand, you would love to read this full buying guide on how to select the best chainsaw chain for the money including reviews & comparison. If you use an Oregon chainsaw or Oregon products, you are sure to see the benefits of maintaining them with Oregon oil and lube. Oregon produces some of the finest and most affordable engine oil and lubes for sale on the market today. This includes 4-stroke engine oil, 2-stroke engine oil, chainsaw chain oil, 2-stroke semi-synthetic low smoke oil and sprocket oil. Available in many bottle sizes, Oregon oil has anti-fling formulation, it lubricates all cutting components, reduces wear, extends working life and protects components from corrosion. If you are looking specifically for Oregon oil, check out this comprehensive guide about available Oregon chainsaw oil. However, if you’re looking for an oil in general regardless of the brand, you would love to read this full buying guide on how to select the best chainsaw oil for the money including reviews & comparison. Blount Inc, under the Oregon brand. Where are Oregon chainsaws made? United States, Canada, Brazil and China. Where do you buy Oregon chainsaws? You can find Oregon products in hardware stores in over 100 countries and online on websites such as Amazon.